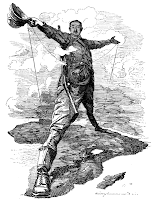 At the end of the nineteenth century, Cecil John Rhodes envisaged a solid block of British territory running from Cape Town in South Africa to Cairo in Egypt and linked by a railway line – the Cape to Cairo railway. Of course, the dream never became reality, and now much more serious problems than a plethora of different railway gauges beset a concept that would require a route through nine or ten independent countries. Still, it is possible to travel a long way by rail if you’re willing to put up with corrupt border posts and warm to middling hostilities between the countries along the way. Wikipedia claims that only the section across Sudan is missing. Perhaps one needs to switch to Camel Gauge for that part of the route. I’ve done the section from Johannesburg to Victoria Falls by rail through Botswana, and that is now a regular tourist route. There is even a very high class tourist train which undertakes that journey, but then it turns around and comes back. 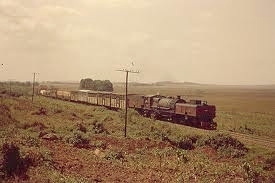 My only experience on more northern African trains was in the early sixties. After a particularly disturbing period in South Africa, my parents decided to emigrate and, unwilling to leave Africa immediately (we eventually ended in Australia but that’s another story), my father accepted the headship of the mathematics department of the University of East Africa at Nairobi. 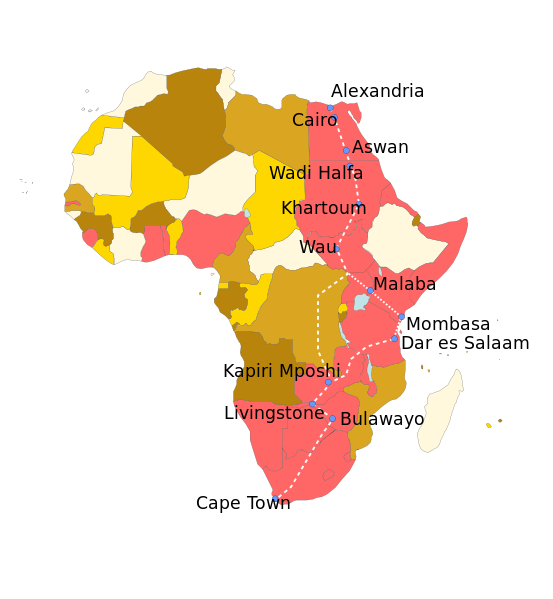 We moved there in 1960 just after Kenya’s independence from Britain, and lived there until 1964. During that time my mother and I explored the wonderful wildlife areas of East Africa in her long wheel base series II Land Rover -christened Brontosaurus - while my father proved mathematical theorems. We also drove down from Nairobi to Johannesburg and back twice, quite an undertaking for a woman with a teenage son too young to share the driving on the 5,000 mile journey. But my mother was like that. As long as she had her Bronto and Africa, she was fine. And, of course, I loved it! We had some adventures, but somehow we always got through … except once. 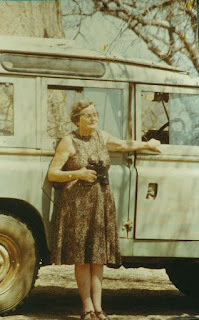 Driving back to Nairobi in 1962, we hit a wet season which was extraordinary. All the roads were unpaved, of course, and, as one approached Lake Tanganyika, they deteriorated into sticky clay. As we headed into southern Tanganyika (as it was then), we found ourselves skidding through ruts and passing a variety of bogged down vehicles, forlornly awaiting rescue. Eventually we made it to a town near Lake Tanganyika, and adjourned to the local hotel for food and news of the way ahead. It was not encouraging. The roads along the lake – not highways at the best of times – had deteriorated into swamps. We would need to backtrack a long way and then head through the center of the country to try to get through. Eventually another plan was suggested. 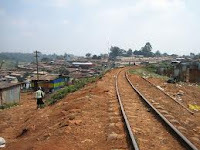 There was a goods train that ran through the town and would travel the whole way up the lake and across to Mwanza on Lake Victoria. There we would be on the doorstep of the Serengeti and out of the mud. I’m sure that nowadays a variety of regulations ranging from safety and health issues to red-tape formalities requiring multiple costly signatures would prevent such an adventure. Then, a few calls from the hotel manager to the station master and the next day the Land Rover was nicely settled on a flatbed truck and we were off. It was three days and two nights before we reached Mwanza. And this was only a goods train so we had to ride in the vehicle. Our view was from the Land Rover windows as we headed north through the sodden landscape, the lake unfortunately out of sight. Luckily we were prepared for camping with food and a bed which spread across the back of the vehicle, but when the train stopped at a station, there would be a rush to the toilets. The train driver knew about us, and waited till the station master waved the all-clear when we were back aboard. Until the last morning. Unbeknownst to us, the driver had changed overnight and the new driver was not aware of his unusual cargo. At the first station in the morning, we emerged from the facilities relieved, only to watch the train and our vehicle pulling out of the station. Only the quick thinking of the station master in switching the signals saved the day. 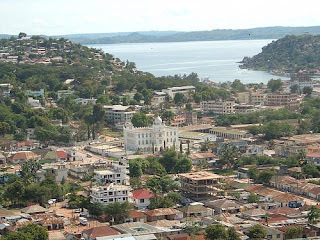 When we reached Mwanza, we checked into the Victoria Hotel and enjoyed baths and cooked food before continuing the trip in a more conventional way. What marvels you have seen and experienced. It leaves me a little awestruck-and a little transported. I can't imagine undertaking such a trip but I think my son would have loved the idea of sitting in the car while the car was sitting on the train. We never took road trips anywhere near the distance you and your mother traveled. Our longest trips were from Boston to Toronto, a wonderful city to visit with kids. Then there were the shorter and more frequent trips to Washington, DC and Williamsburg, VA. Before my son was old enough to read road signs, he had an internal clock that prevented the "are we there yet" questions. My doctor had told me not to travel longer than two and a half hours at a stretch. That meant that when we stopped it was usually at the same places each trip. My son figured out how many stops would get us to where we were going. Your mother was a far more adventurous person than I could be. My rule was that each night we had to stay at a hotel that had a shower at least as good as the one at home. What a story. What a mother. What a son. We certainly had wonderful times together. I suppose there were some potential problems. Once we arrived at a village where a cyclist had been knocked over by a hit and run and was injured. We stopped to see if we could help, and the villagers became aggressive. But a doctor arrived and all was well. There was another occasion when no gas deliveries had taken place along our road and when we eventually reached the border, the car took more fuel than the tank capacity! But I must say all the memories I have are good ones! No, This is Not the Parthenon.